I can't read the text properly, but this is obviously a "*something* city in the year 2000"! 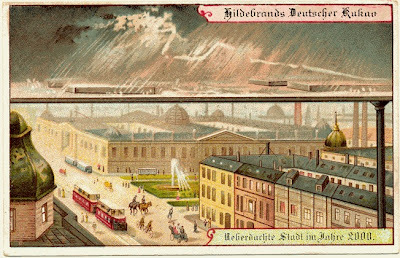 Under a wet and rainy sky (Who knew that a chocolate factory predicted climate change 112 years ago? ), people are leading happy suspiciously well-lit lives under a roof, enjoying green grass, fountains and masonry buildings with domes and pediments, as well as bicycles, horses, and trams for transportation. Is this vision to blame for the phenomenon of shopping malls? Never mind, Bergen is cold today, so bring me to the year 2000!